I concluded my last post with the conclusion that the most important lesson I learned in my time as a Girl Scout Leader trainer was that by getting out of my comfort zone, I experienced great growth. Today I am going to talk more about comfort zones, and some other ways that I have expanded mine. As some of my readers know, I used to be an instructor for the Dale Carnegie course in Human Relations. One of the five drivers for success in that course (and in my opinion the most valuable), is the building of self-confidence. Frequently the difference between a person of average success, and one who is wildly successful has less to do with their talent, and more to do with their ability to carry themselves with confidence. Whether it be the confidence to speak in front of a group, to challenge the status quo, or just the confidence to chase their dreams, it is that confidence (backed by enthusiasm – which I will talk about soon), that makes the difference. How, you may ask, does one become more confident? Why is it that my knees knock when I stand to say the most basic things in a meeting, while others appear to have the grace of a swan in front of a room? To be certain, there are some people who are born with a natural ability to speak, but they are extremely rare and hard to find. Far more people who appear comfortable in front of a group have gotten that way through practice and experience – in short, by expanding their comfort zone. All of us have a zone of comfort. It is that set of things we do with great confidence. Whether it is executing your job, dealing with your close family and friends, or excelling at your chosen hobbies, or any of a million other things, you have your zone of comfort, and so do I. And, the really fun part is that everyone’s comfort zone is completely unique to them. Let me tell you about three ways that owning a pop-up camper over the last few years has expanded my comfort zone. When I bought my camper, I already had thirty-plus years of experience in the outdoors. But, exactly zero of that time was in a camper for which I was responsible. I didn’t know the first thing about how to set them up, take them down, or maintain them. But, even before all those things, I had to conquer the fact that I couldn’t back the thing up. The day we bought the camper, we pulled it home. When we arrived it was getting to be dusk. I had no trouble pulling it behind me, but when I got to my house I had to back it up my driveway. The difficulties I had backing up a trailer were the thing of legend. It took us over 30 minutes to get the camper up our driveway. In that time we unhitched it and tried to back it by hand (really hard to do with a 2800 pound trailer). Also, there was quite a lot of swearing involved. At the end of the ordeal I knew that if I was ever to be successful as a pop-up camper owner, I had to overcome this. The next day when I got home from work, I hitched the camper to the back of my Explorer and headed up to a nearby Church parking lot. It was mostly empty, and I spent the next 90 minutes practicing. First I practiced simply backing up in a straight line. Then I taught myself how to change directions while backing up (as you would to back into your driveway from the street). When I got home, I backed it into the driveway on the second try, with no swearing, to the amazement of my wife. Now, I am not an expert in backing up a trailer, but I have put it in many campgrounds, parking lots and driveways over the last 3 seasons. Backing up a trailer is now somewhat inside my comfort zone. And, that expansion of my comfort zone has enabled hundreds of hours of entertainment at campgrounds. The second way that the camper has expanded my comfort zone has to do with maintenance and problem resolution. When I first owned the camper I knew almost nothing about how some of the systems work, and even less about how to troubleshoot my own problems. I took the camper to the nearby camper store at the hint of any problems, and paid dearly. Since then I have learned to work through my own problems. Usually this is by trial and error, and heavy use of google.com, but I have learned that if I put my mind to it I could solve most of the problems. What was once completely outside my zone of comfort has slowly come into the circle. Oh, and I now save money by conquering minor problems on my own. The third way involves the camper, and an iconic bridge in Northern Michigan. Since I was a child I have been uncomfortable with the idea of going over a high bridge. Put that bridge over water, and I break out in a cold sweat…or, I used to. 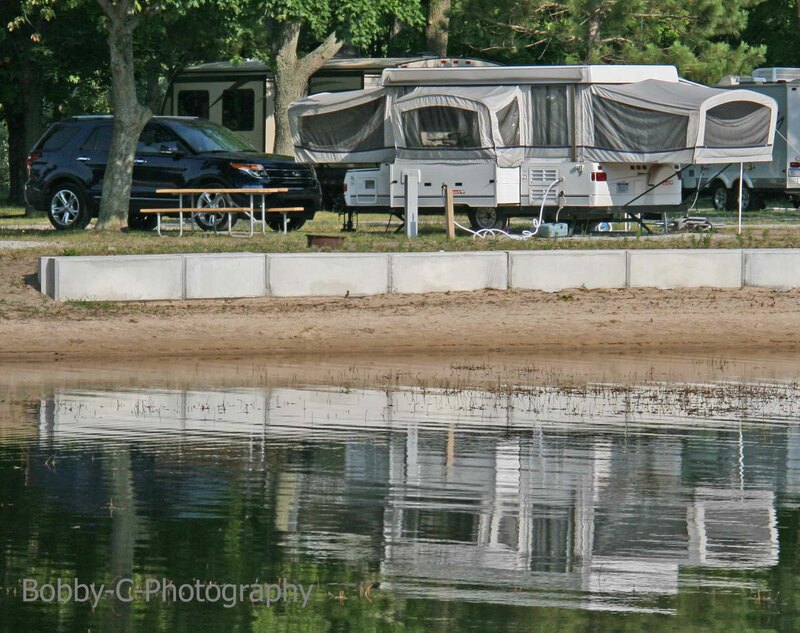 One of our first trips with the camper was to Michigan’s Upper Peninsula. To get there I had two choices, I could make two day trip through Chicago and Wisconsin, or drive over The Mackinac Bridge. I was determined to get to the campground, and not spend half of my vacation traveling, so I planned to cross the bridge. I had crossed the bridge four other times in my life, and each time it was a white knuckle experience. I wanted this time to be different. We drove for about 7 hours to the bridge, including a 2 hour side trip to have the tires replaced on the camper after a blowout. 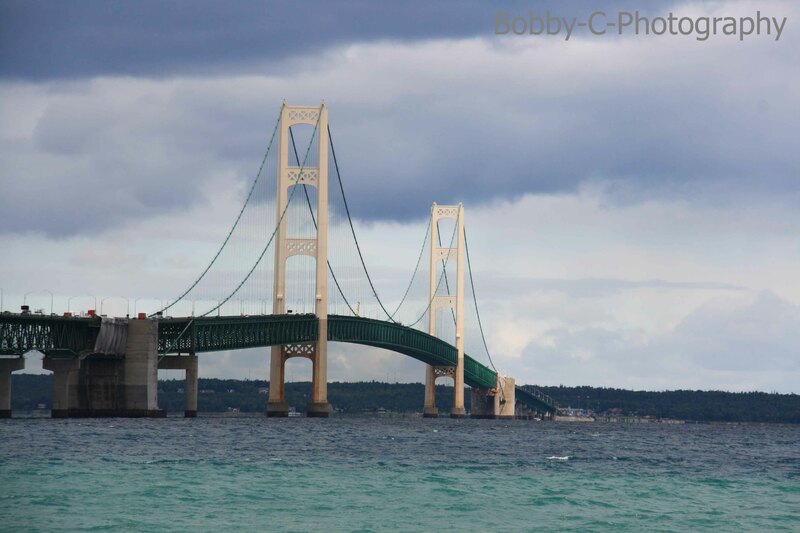 When we got to the bridge, I took a few deep breaths, reminded myself that the law of averages said that I was very unlikely to suddenly find myself flying through the air toward the Straits of Mackinac. I gripped the steering wheel, turned off the radio, and told my wife to maintain vehicle silence until we were off the bridge. We made it safely to the other side, and my smile was a wide as the center span. What I am saying is that, with the right motivation and by having a few successful experiences, anyone can expand their comfort zone. My suggestion to you is to find something in your life that you want to do, but are held back by fear. Take that fear by the horns, throw it aside, and start pushing your personal envelope! It will be scary at first, you will probably fail a few times, but persevere! I can tell you from my own personal experiences that the rewards will be great. This entry was posted in Bobby C's Follies, Personal Reflections and tagged backing up a camper, bobby-c, comfort zone. Bookmark the permalink. Someone from the bridge authority will drive your vehicle over the bridge. That is a wonderful service they offer.